I have seen fighter planes on war ships landing and taking off like they were natural runways. I also saw other gigantic structures of arsenals that were scary to death, really. But I've never seen them personally other than from movies and documentary films over the past decades or so. One stroke of a finger means death to thousands, and houses and/or properties can be blown into pieces in seconds. That's how powerful these weapons of destructions are. Yes, they are scary but I still wanting to see one. 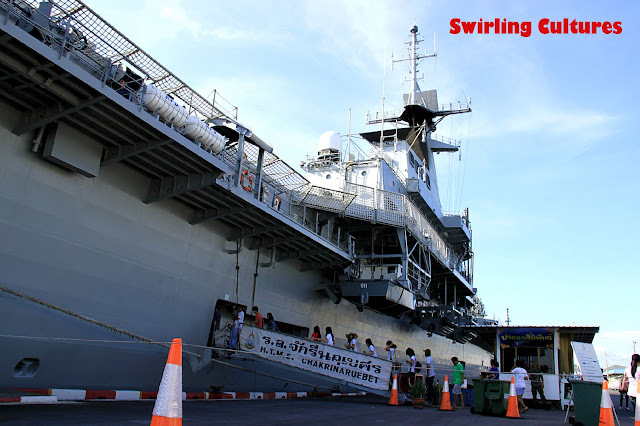 My childhood wish was granted two weeks ago when we took a trip to Rayong and stopped by in Sattahip District in the province of Chonburi, where the famous aircraft carrier the H.T.M.S Chakri Narauebet is kept. 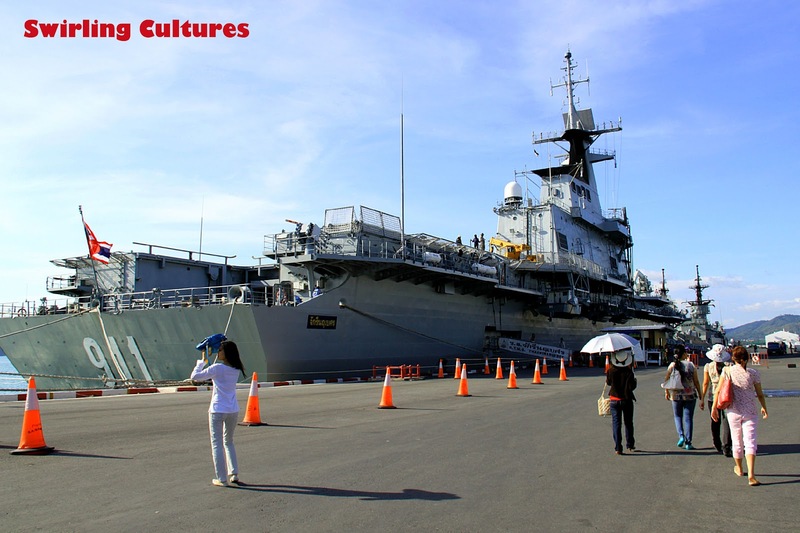 The carrier was designed by Spanish shipbuilder Bazan and was commissioned into Royal Thai Navy in 1997. Foreigners are literally not allowed to get inside the ship. But since we were doing this educational trip for our first year students, the navies who were guarding the ship's entrance allowed me and my friend to explore the depths of this first aircraft carrier in Southeast Asia - thanks to our Thai friends who paved way for us to get in. Although it was in stationary position and smaller compared to other aircraft carriers of other bigger and powerful nations in the world, its little movement technically scared the crap outta me. I thought it's gonna go out for war! LOL..
PS: The first and last photo is the same ship. The middle one however is the thing I failed to name. 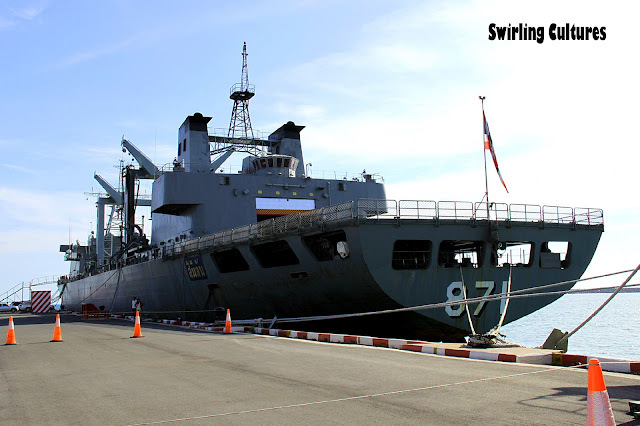 It was another ship docked next to H.T.M.S Chakri Narauebet. these ships are used for deterrence especially with the terrorist attacks all over..
the air shows are always awe inspiring! Ikaw na ang maswerte at pinayagan ka sa loob... How many aircrafts did you see inside? Now reality of not only seeing the warships but of boarding them is realized. Since you were kid, you'd been dreaming these "scary" battleships. it would've been EXTRA nice if they allowed you to go inside the bridge. I have seen an airshow/flypass in England for free and also when they practise cos the their camp is just near where I stayed in England. I havent seen one war ship yet but seen miniatures in one of the museums in London. Tnx for the share! Bet you had fun! my dad is such a fan of ships like this one! matutuwa un kapag nakita niya to. thanks for sharing!